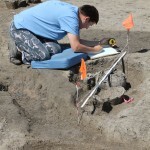 Modern cemetery excavation requires detailed field recording using a variety of techniques. Screen: Sediment from archaeological contexts is passed through a sieve in order to catch small artifacts such as fish scales, crushed bone, and bronze fragments. Total station: A total station is an electronic theodolite, a surveying instrument used to record the position of artifacts and archaeological features such as grave pits and trenches. 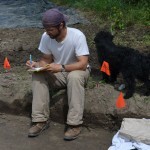 Note taking: Even with all of the hi-tech equipment used on site, old-fashioned note taking is important for processing patterns observed in the field, and reminding yourself to finish certain tasks in the lab that evening. Drawing: Drawing human burials and other features in the field is important even if we take photos from multiple angles and measurements with the total station. Drawing requires us to interpret what we see, and process the location of skeletal remains, form, orientation, decoration, and profile of vessels still in situ.